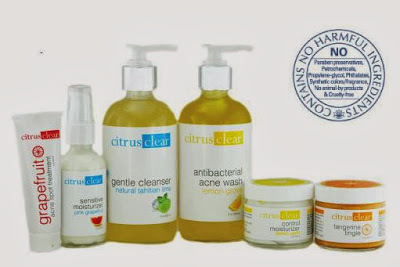 I have had the privilege to do a review on a Citrus Clear product in the past and the results were amazing. I am a huge fan of the products that they offer and how well they make my face feel. I had the opportunity to do a review for them once again on the Gentle Cleanser Natural Tahitian Lime. The Sensitive Face Wash (with natural tahitian lime) makes you feel like you are on vacation every time you use it. It contains a mix of gentle citrus ingredients which are recommended for those with sensitive skin, to keep skin in balance, clean and fresh. Sensitive skin types need a sensitive cleanser. Formulated to remove excess oil without overs stripping your face of its delicate balance. Gently washes away oil, dirt and bacteria. 8oz. I really like the Sensitive Face Wash and all that it offers. It offers a great citrus scent that reminds me of summer. I like that it for formulated for sensitive skin, which makes it great for me to use as well as my daughter. Where she is only 9 and I am working at getting her to get into a routine of cleaning her face daily and this product is amazing for her age group. It has helped keep her face fresh and clean. While it has helped, my face stay clean and clear of any imperfections. We use this item daily and have not had any breakouts, redness or any irritation at all. I also love how it has made my face feel much smoother and cleaner after each use. I like the Tangerine Tingle face scrub.